Guided with its theme: “Pagkakaisa Para sa Handa, Ligtas at Matatag na Paaralan Tungo sa magandang Kinabukasan,´the annual and week-long activity Brigada Eskwela 2018 was formally initiated and started on May 28 to June 02, 2018 to make each schools nationwide environmentally sustainable and conducive to learning. Brigada Eskwela (BE) known as National Schools Maintenance Week entails endeavors that extremely exhibit the spirit of a shared responsibility within the community in helping the Department of Education in providing quality, accessible, relevant and liberating basic education for all Filipino learners. This aimed to bring together all its stakeholderS to participate and contribute their time, efforts and resources to prepare the school facilities for the opening of classes. As stipulated in DepEd Memo Nos. 66, s. 2018, the activity consists of caravan in the Regional and Division Offices and a kick-off ceremony in every school which served as the end point of the caravan. School heads were encouraged to make Brigada Eskwela not just a tool in improving school facilities but as a catalyst for achieving higher learning outcomes in every schools and a mechanism to elevate the level and participation of all stakeholders specially in realizing the department’s vision and mission. They took the lead role in planning activities geared on making schools ecologically conscious, resilient, clean and conducive to learning. 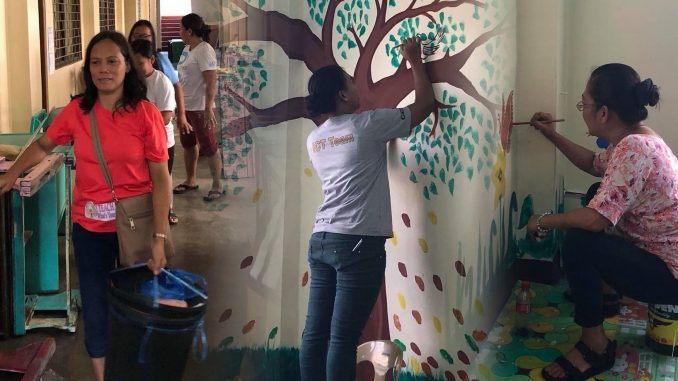 Not only the teachers but all of the employees of DepEd Pasay City participated and enjoined the conduct of Brigada Eskwela 2018. SGOD Specialists together with the Education Program Supervisors and Public Schools District Supervisors collaborated with each other in assisting all schools during the implementation of BE.